It's gotten to where I can handle the carnage. Small animals, usually barely-recognizable birds, feet removed, wings off-kilter. It is ugly, distasteful gore. But I can remove myself a little. Scoop them up into baggies, place them in the trash. Lower the lid. I feel some guilt about this, but our turf is about two inches deep. If you know Atlanta, you know then that at the high points (where we live) all is rocks and clay. Not burial ground material, really, unless you have a back hoe. Besides, given the volume of 'prizes' our young cat has deposited on our stoop... you would soon realize that one year with a huntress cat on our tiny plot - and we would have a mini-Arlington cemetery. At some point, burial is impractical - and I have no suitable incinerator of my own. Yesterday, though - into our quiet late Sunday afternoon, having Sunday-schooled, homeworked, and erranded, with grill lit and evening approaching - Sebastian came in from the back deck with "Mom! Chessie did it again! This time a Rare and Exotic animal!" My stomach sank, though I doubted his "Rare and Exotic" claim. I shhhed him. The littler littles did not need to know about this. But I could handle it. Frankly, after the Helter Skelter bird scene two weeks back -three birds. One stoop. Many parts- I was prepared for gruesome. She would look asleep, except for the angle. And the wide open eyes, still bright, extra-large, coal black. The death was recent. 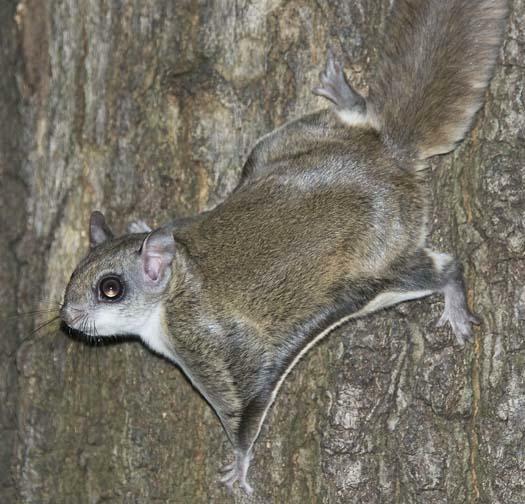 A flying squirrel. Sweet faced. Wide-eyed. Still warm through my baggie. I touched her with one finger. Crazy soft. Fur coat soft. Kitten chin soft. With the baggie, I lifted her little arm, saw how the skin connected, expanded. Her tiny exposed chest suggested she had nursed recently. A litter somewhere, abandoned? I put her in the trash and, at midnight, was haunted by my conscience. It didn't seem right. So, after work out, coffee, morning chaos, cereal complaints, multi-staged flurry out the door, and return home... I got a spade. I found another corner, under the deck. I dug. Top layer: weeds and last year's pinestraw (reminding me again that I really must do something with the yard), then rock and broken concrete, a pine cone. Lots of clay. Formulas in my head - if people average 5'7" and burial is at 6 feet... how deep do I go for a sweet faced squirrel? I dug a little further, a little wider so the body wouldn't be bent. I was reminded of biology and anatomy - of Bill, my beloved lab partner - a vet now, and even he couldn't have helped this creature - getting married next April. Of dissections and formaldehyde fumes. I was always fascinated and horrified at once. And so it was with this creature - the arm flaps that helped her glide (though, where, I wondered? In our thoroughly developed neighborhood, even the most ambitious squirrel could not glide tree-top to tree top - not without high gusting winds and unusually developed flying skills) the smaller, flatter tail. She was in-tact. It made it harder than skinned minks, fetal pigs - and later, those eviscerated birds. Since here, with Kitten (now grown, aka Chessie, Chestnut, Miss Chesapeake, Chessica) the death toll has reached over a dozen. Chipmunks, mice, a couple of tiny snakes, two velvetty moles, many birds. That bunny. They say either your cat is a hunter or it isn't. Clearly, this one can hunt. And is compelled to do so. I lowered the small, lovely creature. I said a prayer. I patted earth. I was glad, again, that children were elsewhere and mostly had no idea. I was relieved that she was in the earth, and not on top of the Herbie Curbie. "Remember men that we are dust and unto dust we shall return." I sighed. And returned to my day. I recognize all of this. i do. A fair & fitting tribute.